This is not the usual lengthy fantasy novel readers have come to expect from Brandon Sanderson. It’s much shorter, faster-paced, and has more humor. The Alloy of Law is as much a western as a fantasy novel. While part of his Mistborn series, it’s set 300 years later, with all new characters. Waxillium and Wayne fight crime in the Roughs, aided by their magical allomantic and feruchemical powers. Wayne can create a slow time bubble and heals well, while Wax can push on steel and make himself lighter or heavier, moving like a superhero. After a tragedy, Wax must move to the family mansion in the city of Elendel, become Lord Waxillium Ladrian, and take over the family business. He also needs to start a family, and meets with Lady Steris and her father, Lord Harms, to discuss a proposal for courtship and possible marriage. Their first date, where they are joined by Steris’ cousin Marasi, a student of criminal justice, is at a wedding banquet. Their waiter turns out to be Wayne, a master of disguise. When thieves break into the banquet hall, open fire, and kidnap a lady, Wax and Wayne are back in the crime-fighting business, aided by Marasi. Recent mysterious railcar thefts and kidnapping of ladies with allomantic or feruchemical powers are probably connected, and they suspect their former colleague Miles, who is practically impossible to kill, of turning villain. A fun read, and a nice change of pace. I read the book, but the audio version is also getting great reviews. This morning a group gathered at the library to discuss this fifty-year-old novel, which was recently reprinted. It is the family saga of Callie and Matthew Soames and their daughters, moving back and forth in time from 1896 to the 1950s in rural Missouri. 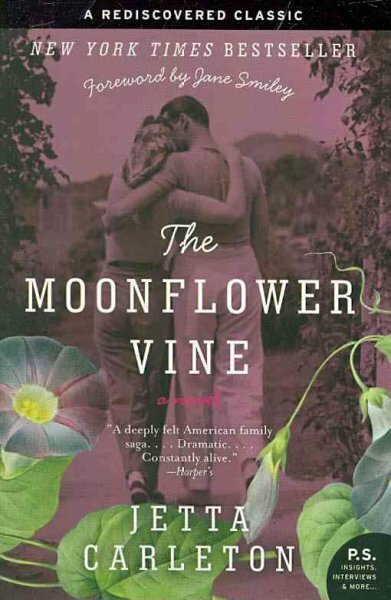 The group agreed that the book starts out very pleasantly, with three grown sisters and one grandson gathering with their retired parents at their Missouri farm for a few weeks in the summer, playing in the creek, making ice cream, and watching the moonflowers bloom in the evening. Through the different sections of the book, each told from the viewpoint of a different character, we learn about the cracks in Matthew’s and Callie’s marriage. Matthew is a teacher and school superintendent, while Callie can hardly read. Eldest daughter Jessica once broke her parents’ hearts, while dutiful middle daughter Leonie wonders why her parents are content to spend summers on their farm, with no plumbing and old furniture, while their town house is up-to-date. Their wild younger sister comes to life, but we never really learn what she is thinking. Various young men, including a daring pilot, come in and out of the family circle, none entirely satisfactory, at least not to stern Matthew and loving Callie. Tragedy occurs, but life goes on, and we circle back to the girls’ annual summer trek back to the farm, from their unique lives as a farmer’s wife, teacher, and television producer in New York City. Everyone has secrets and occasionally feels the need to escape from the proper behavior a school superintendent expects from his family. So the sweet beginning of the book is a bit deceptive, just skimming the surface of the family’s real life. As the book moves back and forth in time, I was occasionally confused as when certain events took place. None of the group had come across this novel before, long thought to be the only book by New York advertising writer and former dancer Carleton, who grew up in rural Missouri, but a manuscript has been found for another novel, and Clair de Lune will be published next month. This is the second book I’ve read by Polly Evans, and her books are the ultimate in armchair travel entertainment. Follow Brit Polly as she takes a solo motorcycle tour of New Zealand, just weeks after getting licensed to drive a motorcycle. The bike she rents is so heavy she can’t pick it up when it falls over, as happens more than once. With Polly, we see all the amazing sights, cities, and wildlife of North and South Islands, while seeking to discover if the original Kiwi bloke still exists. Speaking of Kiwis, her description of a guided nighttime hike looking for the flightless kiwi birds is hilarious. She finds the people friendly, and visits with many friends of friends or relatives, and finds many of the men quite manly, but with a softer side that makes her wonder if they’ve all gone modern. Even the tough sheep shearers are affectionate parents. 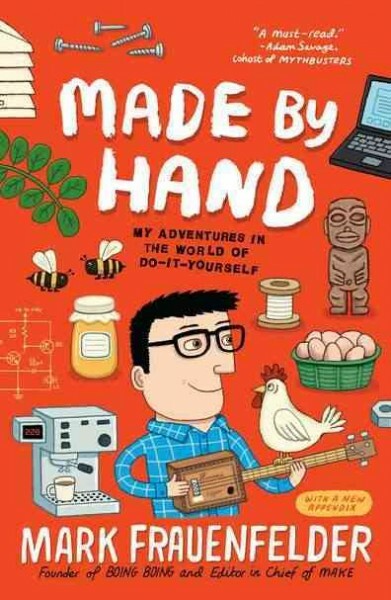 Kiwi ingenuity is widespread, but many immigrants are equally creative. There is quite a bit of history in the beginning chapters, but then the reader gets caught up in Polly’s adventures as she travels around the country. Polly claims to be a bit cowardly, but goes on marvelous adventures, and doesn’t even get seasick. Hiking, climbing, tethered flying, fishing, kayaking, and sheep shearing are all described. Only two things really seem to scare her: falling off her motorcycle, and bungee jumping. Driving through a hailstorm isn’t fun, either. Previously she rode a bicycle all over Spain, and in later books she takes public transportation around China, rides a horse and tangos in Argentina, and learns to drive sled dogs in the Yukon. We don’t own her books, but they are available in nearby libraries, and can be requested through interlibrary loan. For more about Polly’s travels and photos from her travel’s, visit her website. Also recommended is Bill Bryson’s In a Sunburned Country, about travels in Australia. This is an intricately woven novel which incorporates grand themes such as love, marriage, death, history, religion, and art. Most of the characters are Jewish, and there are two main plots. Joseph draws many Ketubah but becomes disillusioned when the reality is the Ketubah does not guarantee happiness. He meets Max and they both swear to never get married. Many years later Josef meets Hannah when they are both trying to flee from Hitler’s regime. They are married in line at an emigration station, both intending to go to Palestine. But they never leave and Hannah becomes pregnant with baby Herman. Max secretly loves Josef and is not pleased to share him with Hannah. All three of them end up in the concentration camps. Baby Herman escapes the fate of the concentration camps and grows up to be a Buddhist. Herman’s son Benjamin becomes a troubled, gifted artist like his grandfather. The second plotline (taking place in present-day New York) involves an art critic named Daniel Lichtmann, whose wife Alexandra has a suicidal affair with Benjamin. The deaths occur at the book’s beginning, and Daniel tries to discover why this happened, and unravels the stories of Josef, Max, and Hannah. All of these characters are caught up in or haunted by the Holocaust. This is beautiful and powerful writing and deserves to be mentioned in the same breath as Schindler’s List and Sophie’s Choice. 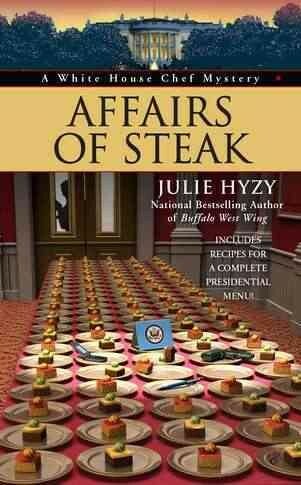 This is the newest entry in the White House Chef Mystery series by Hyzy. Olivia (Ollie) Paras is the White House executive chef, the first woman to hold that position. She is dedicated, hard-working, and has the strong ethics required of any White House employee. The problem is that she is frequently in the wrong place at the wrong time and stumbles across things she shouldn’t, such as dead bodies. And her curiosity sometimes gets the better of her. These stories involve lots of insights into the doings at the White House and interesting tidbits about how the rather small kitchen staff prepares the meals for the First Family, as well as the details involved in planning the large events—state dinners and luncheons. The White House sensitivity director, Peter Everett Sargeant, and Ollie, who have had clashes in the past, need to work together to prepare a lavish birthday party for the Secretary of State. Things go awry immediately, and the complications compound. The Secret Service is involved, as well as numerous other White House employees. This book does not focus as closely on the First Family as the earlier ones do, but it is a fun read, clever, and Ollie is a fine, well-developed character. The rest of the kitchen staff is also well-drawn. Hyzy includes some recipes in the back of the books also. Anyone for Pastry-Wrapped Asparagus Spears with Prosciutto?